From the 1920s to the 1940s the Hudson’s Bay Company (HBC) was using its own ship, the RMS Nascopie, to bring supplies to its northern stations and to rotate its employees in the Arctic. Every summer, as long as conditions allowed, the Eastern Arctic Patrol (as the yearly trip of the Nascopie was called) meant fresh supplies and the opportunity to receive basic health care. In addition, the ship carried goods (mainly furs) and people out of the communities. It is interesting to know that, from 1933 to 1941, the Nascopie also took tourists on board for a summer cruise of the Arctic! Indeed, the Nascopie was typically carrying the personnel necessary to provide basic health care: a doctor, a dentist, an optometrist, etc. In 1945, Dr. Roy Gordon Hemmerich, a dentist from Kitchener, Ontario, was hired by the HBC to provide dental care for the company’s employees and their families. Other people living in the North, mostly Inuit and Royal Canadian Mounted Police (RCMP) officers, were to receive dental care “to the extent of the time available”, as stated by the HBC in a letter to Dr. Hemmerich dated April 16, 1945. According to the letter, the services of Dr. Hemmerich would be paid “at moderate city rates”. Dr. Hemmerich decided to go ashore to provide his services, while the dentists who had made the trip before had chosen to treat patients on board the ship. 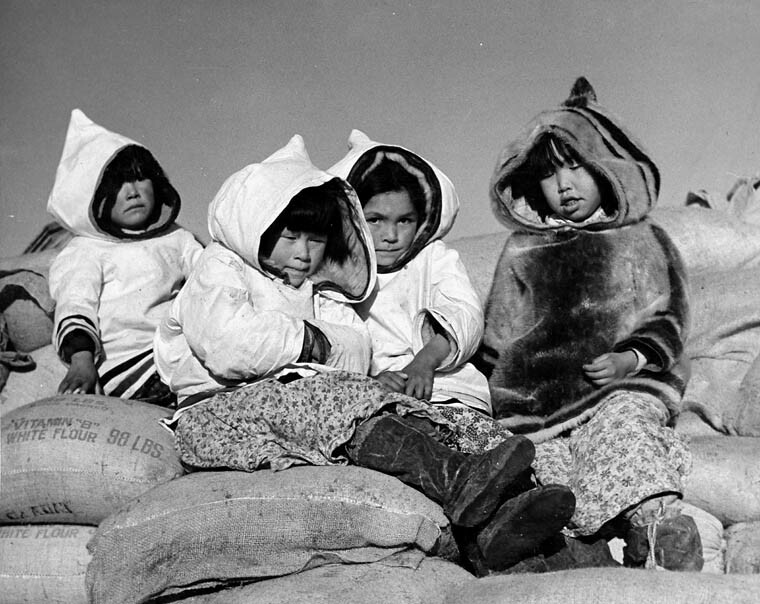 Close to a hundred Inuit were treated by Dr. Hemmerich in the summer of 1945. Group of children watching the unloading of supplies from RMS Nascopie (e002213356). Facebook. 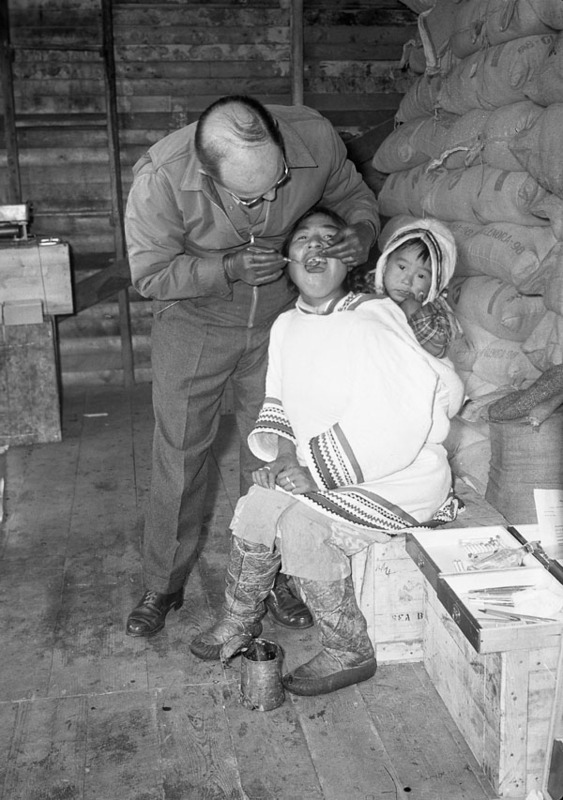 Dr. Roy Hemmerich performing a dental exam on an unidentified woman onshore, during a trip by the RMS Nascopie from Pond Inlet to Fort Ross (a184875). Facebook. Even though the Nascopie sank in July 1947 after hitting an uncharted reef off Cape Dorset, Dr. Hemmerich made two additional trips North, in 1949 and 1954–1955, but the 1945 trip is by far the most well documented. Indeed, both Dr. Hemmerich and Dr. Arthur H. Tweedle, an optometrist and amateur photographer who was also part of the 1945 Eastern Arctic Patrol, have left textual documents, but also photographs and moving images, maps, etc., about their trip. Even though they are not from an Indigenous perspective, the Roy Gordon Hemmerich fonds (R15580) and the Arthur H. Tweedle fonds (R848) provide interesting testimonies of life in the Arctic around 1945. Do you recognize someone in these pictures? Please let us know! You can either email us, or follow the Facebook links under each photograph. You can also visit the Project Naming Facebook or web page to look at other photographs in the Library and Archives Canada collection that need identification. Mathieu Rompré is a reference archivist in the Public Services Branch at Library and Archives Canada. This entry was posted in Indigenous Resources and tagged Arctic, Arthur H. Tweedle, Hudson Bay Company, Inuit, Nascopie, Roy Gordon Hemmerich by Library and Archives Canada Blog. Bookmark the permalink.